Happy New Year! I was never one to go to some crazy party and stay up until the wee hours of the morning on New Years Eve. I never really saw the point, and, honestly, I value sleep a little too much. 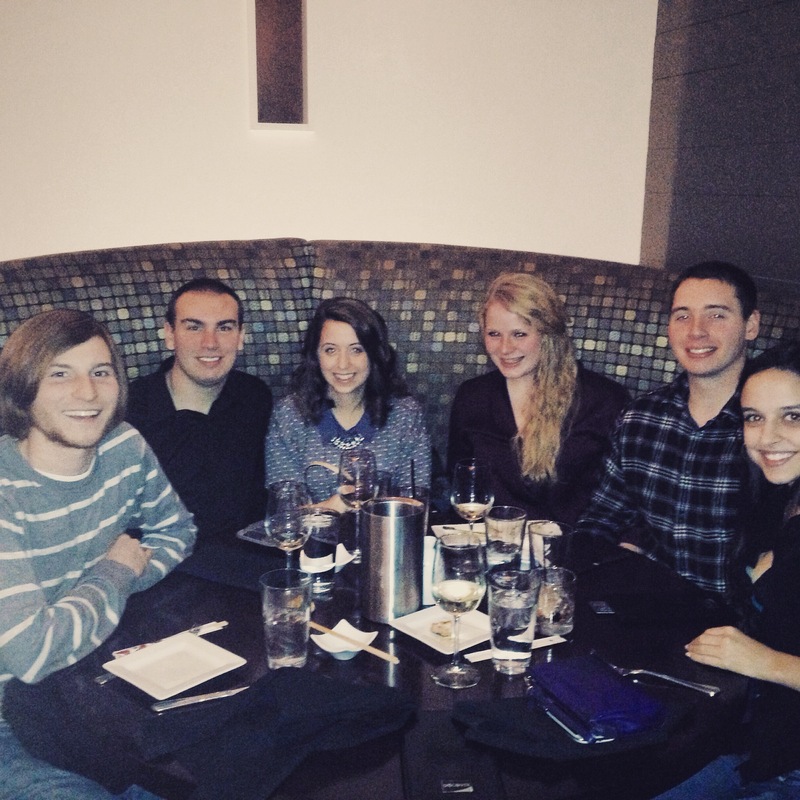 But I did end up going to one of my favorite restaurants, Tamari, last night with a group of friends from high school. We had a wonderful time, and the food was, of course, fabulous. 1. READ – I loved to read as a kid, but I have definitely gotten away from it after I started college. I have a huge list of books to read until I start my big-person job in the summer: The Bell Jar, The Great Gatsby, Fahrenheit 451, Gone Girl, The Power of Habit, etc….have any other suggestions? 2. Focus on the good and stay positive – huge one for me. I’m sometimes a Debbie-Downer…which is so no fun for anyone. 3. Have weekend plans – I like to grocery shop and watch Netflix a little too much. Having plans = branching out = meeting new people = goodness. 4. Write – One of my biggest passions in life is to put pen to paper. I’m hoping to dedicate a little more time to this blog, too. Merry Christmas! I hope you all had a wonderful holiday full of yummy food and pleasant family time. We had a very low-key Christmas, but it was so nice. After going from running on all cylinders trying to buy the perfect gifts, sitting around while sharing stories with family over a glass of wine was exactly what the doctor ordered. This dish is one of our favorite appetizers this time of year because it’s just so darn pretty and festive. And full of creamy, gooey, herby goodness. Every time my Aunt Jackie, the wonderful mastermind behind this Pesto Brie, is in town, we can almost always expect this dish to be set out as an appetizer. The anticipation of watching the Pesto Brie emerge from the oven as a hot gooey mess is almost too much to handle. And the fact that it can go from dish to table in less than 30 minutes? Pure perfection. Trust me: you need this in your life. My name is Alexa Peduzzi, and I am an oatmeal addict. I figured this was a respectable way to start Fooduzzi – an admittance of my obsession with the lowly oat. Believe you me; they will be making many appearances here. I can honestly say I have had a bowl of oatmeal every day for about five months. I apologize for being a 99-year-old woman.